Digital watershed for Bundesliga ahead? 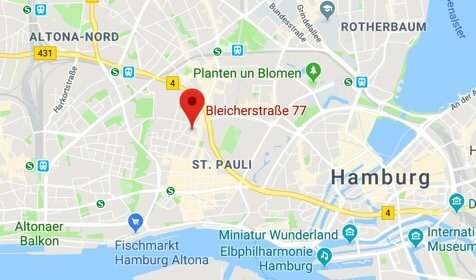 The biggest move forward made Frankfurt (from rank 16 to 7, a plus of 16 points) and Nuremberg (from 17 to 6, a plus of 21 points), mostly because of the efforts they put into new websites and apps. All clubs maintained a better score than back in August, when the first analysis was published by deepblue network. Augsburg and Gladbach were the only clubs to lose points in the ranking. One might think that the Bundesliga moves in the right direction, which is true. On the other hand, the club’s digital performances don’t match their abilities on the field. Rightly, most decision makers now invest in infrastructure – like in Leverkusen, Dortmund and Hamburg, were parts of the grounds are or will be WiFi-enabled – „but this will only pay out in combination with exciting communication concepts“, claims Oliver Drost, Managing Creative Director at deepblue networks. Wheras other clubs are still struggling to maintain or build their digital infrastructure, the Bavarians can concentrate on more difficult tasks. Having a big digital staff and the money to provide both WiFi and LTE solutions in the Allianz Arena, the club saves ressources for working out individial digital communication concepts with their sponsors. Other clubs might have close up in that area, but Bayern is still No1 when it comes to brand building. “Mia san mia” translates into “Us are us” and has fuelled the club’s identity since its instalment some years ago – and now the Bavarians are benefitting massively with money from sponsors. If the real table would look like the digital league, the HSV would be quite proud: Not far behind two-time champions Dortmund and in front of all northern rivals. But their struggle for survival in the league might also put a shadow on further digital improvements, because money needs to be spend on new coaches and players. 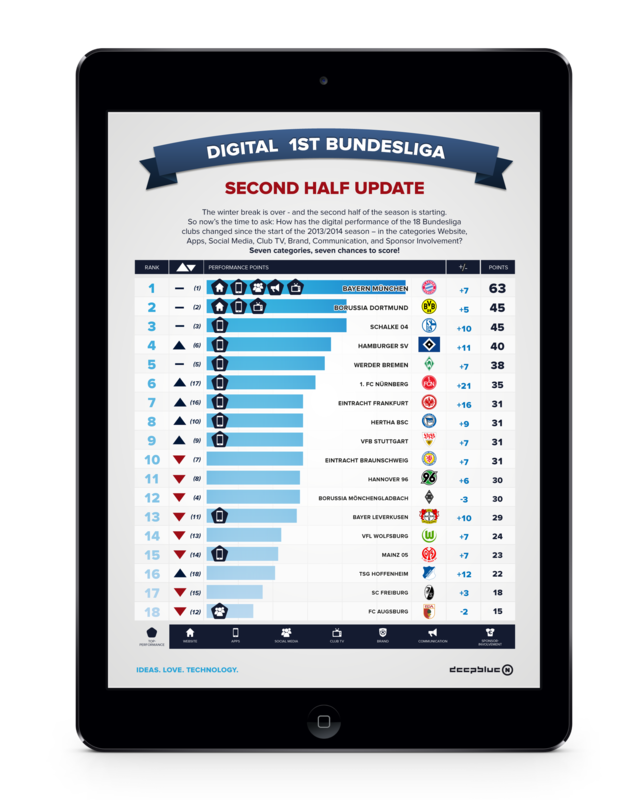 When it comes to apps, the HSV is on eye sight with Bayern and even beats them in Twitter usage. On the other hand, their website still isn’t top-notch. But the deepblue results provide one big surprise: HSV TV is only given 1 point out of 5, despite featuring several content formats and even implementing some storytelling for sponsors. The two-time Euro League participants are a good example for what happens when investing money into infrastructure doesn’t go hand in hand with new storytelling or platforms. Since winter, the club has introduced a new Twitter hashtag #niemalsallein (never alone – the first line of the club’s anthem) and appeared more active in the micro blogging network. Unfortunately, this isn’t the No1 platform for most fans in Germany and although 8 players are now active on Facebook, their following of 77,600 is dwarfed by the 20 million fans of 18 Bayern players. Beign neither big or small, Hannover is stuck in the middle – not only in the league, but also in digital terms. 2014 could prove to be an interesting watershed for the digital efforts of the Bundesliga. The infrastructure is mostly running smoothly, but only with extra money and creativity new fans and target groups can be reached. Working together with sponsors might be a good way out – like in Hannover, when sponsor HDI helped to made certain areas of the stadium ready for Wi-Fi – and by this activating their claim „Hilft Dir Immer“ (Always helping you) in good style.